The pen may be mightier than the sword, but if it lacks the capabilities available to users on other platforms, it’s of limited use on the Mac side. Good news then for Mac users of the Pulse Smartpen device: they now have access to a Mac-friendly handwriting-to-text transcription service for the computerized pen that captures audio and links it to handwritten notes. 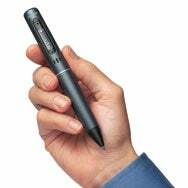 The service is a collaboration between Pulse Smartpen maker Livescribe and Vision Objects, which specializes in ergonomic alternatives for text input. Released for the Mac earlier this year, the Pulse Smartpen is a ballpoint pen with a built-in flash drive that records what you write or draw. Use the pen in conjunction with Livescribe’s special paper, and the pen will record any sound going on as you write things down. Livescribe touts the device as ideal for lectures, business meetings, and other note-taking sessions. Since releasing the device, Livescribe says its most frequently-received request from Mac users has been handwriting-to-text transcription. That led to Monday’s announcement of MyScript for Livescribe, which lets Pulse Smartpen users edit handwritten notes in Word, create a dictionary of frequently used words, and convert shapes, drawings, and tables. The software is available to Pulse Smartpen users as a free 30-day trial from Vision Objects. An activation code costs $30. You’ll need to be running OS X 10.4 or 10.5 on an Intel-based Mac to use MyScript. The Pulse Smartpen sells fro $150 for the 1GB version and $200 for the 2GB model.